Following on from our article on Hazards and Top Events, let’s move on to Threats and Consequences. These are the next elements to put into our BowTie diagram and just like all BowTie elements they have specific roles to play. 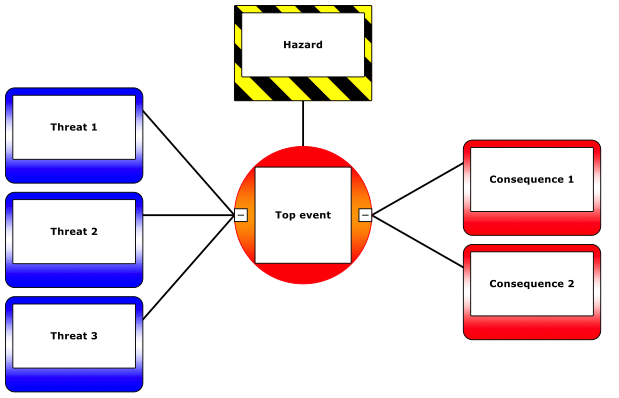 To recap briefly on the previous article[L1] , in BowTie we use the Hazard to describe the potential source of harm (be it a condition, an object or an activity) and the Top Event to describe a loss of control over the Hazard. Now we come to our next step, which is to describe the things that cause the Top Event i.e. the Threats. These are the things that we want to either eliminate or reduce our exposure to; the things that we create barriers against. In most BowTies we will usually identify multiple Threats. Consequences (which we will get to in a moment) should describe the events (usually undesirable ones) that flow from the Top Event. So we are telling a story here, moving left to right along a causal pathway. A Threat causes the Top Event and the Top Event causes the Consequence/s. The great thing about this approach is that we now have the opportunity to depict multiple scenarios and interactions in one simple diagram. In the example below we are looking at a BowTie related to landing an aircraft. It is just one of several and it is important to remember that a Hazard will often have multiple Top Events not just one. As with Threats, there could be one or several Consequences shown in the BowTie. 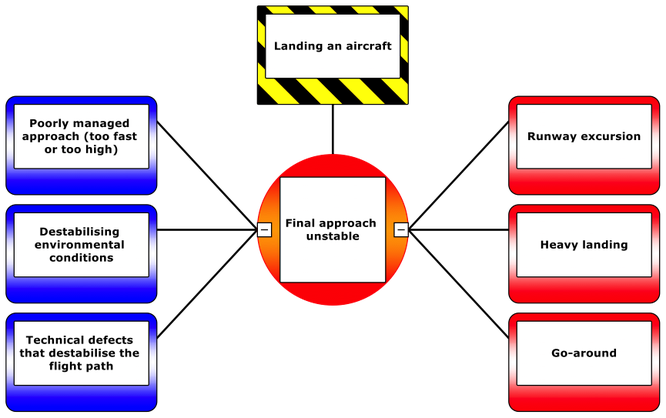 Here we are going to describe the potential events that could follow on from a loss of control scenario. It’s important to make sure we include a description of the event not just a description of the damage or loss that results from an event. If we just described the Consequence as ‘loss of life’ for example, we would not capture the event that we want to manage in the first place. So there is a difference between the Consequence (the event) and the severity of its outcome. In BowTie, we always want to describe the event and if helpful we can add severity information to that description e.g. “Heavy landing resulting in aircraft damage”. The severity information will be useful if we want to add a risk matrix score to the Consequence (which we will have a look at a bit further down the track). So far we have been looking at scenarios as if there are no Barriers in place. In most cases there will of course be Barriers (or layers of Swiss cheese) in place to help interrupt the cause and effect relationships we have depicted and we will look at those in our next article. · New ‘BowTiers’ (OK I just made that word up) often confuse Threats with Barrier failures. Ask yourself : would this actually cause the Top Event, or is it something that allows it to happen by defeating a Barrier? · In your description of a Threat or a Consequence, consider that you may not be in the room to explain it to someone else is looking at it. So make yourself understood with that in mind. · Consequences should always include the ‘worst credible’ outcome. If you only include the ‘most likely’ outcome you won’t be including all of the necessary barriers.